What is the temperature range maintained by an ILR? An ILR maintains the temperature between +2°C and +8°C. At what level of health care delivery are the vaccines stored in an ILR? An ILR is used to store all Universal Immunization Program vaccines at the Public Health Centre (PHC) level. Why is an ILR used at PHC for storage of vaccines? This is because the power supply at PHC may be unreliable. An ILR can maintain a temperature from +2°C to +8°C with as little as 8 hours of power supply in 24 hours. If the electricity supply fails, then the ice lining maintains the inside temperature of the refrigerator at a safe level for vaccines. Also an ILR has a top-opening lid which prevents loss of cold air during door opening. Therefore the temperature is maintained in ILR for much longer duration than in deep freezers and ILRs can keep vaccine safe. ILRs are available in two sizes – large (for districts) and small (for PHCs). Which is the coldest portion of an ILR? The bottom of the ILR is its coldest part. How are the vaccines stored in an ILR? Vaccines are stored in baskets hanging into the ILR cabinet. The vaccines are arranged according to their freeze sensitivity; the least freeze-sensitive vaccines are placed at the bottom of the basket and the most freeze-sensitive vaccines are placed at the top. Also the vaccines should be arranged as per their expiry dates. (Early expiry should be kept above the later expiry ones). Mention the order of storing the NIS vaccines in an ILR. •	Measles containing vaccine vials are then laid out over bOPV vials. The diluents are kept at the top. Can you prepare ice packs in an ILR? No, there is no freezer compartment in an ILR; hence, ice packs cannot be prepared in an ILR. Mention the precautions for storing vaccines in an ILR. •	Keep all the vaccines in the basket. No vaccine or diluent should be kept directly at the bottom of the ILR. •	Leave a space of 2 cm between the boxes for circulation of cold air. •	Place a thermometer among the vaccines in the basket. •	Keep freeze-sensitive vaccines at the top and the heat-sensitive vaccines at the bottom of the basket. •	Keep further expiry date vaccines toward the bottom and early expiry date ones toward the top. •	Do not store other drugs or food in the ILR. •	Remove and discard expired vaccines from the ILR. What is meant by the "hold over time” of cold chain equipment? In the event of power failure, “holdover time” for any cold-chain equipment is defined as “the time taken by the equipment to raise the inside cabinet temperature from its cut-off temperature to the maximum temperature limit of its recommended range”, e.g. in the case of ILR, if the temperature is 4°C, then the time taken to reach 8°C from 4°C will be the holdover time for that ILR. On which factors does the hold over time of the cold chain equipment depend? 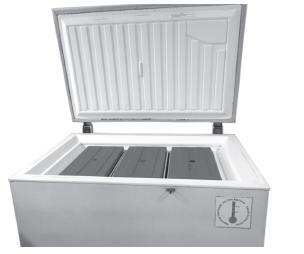 Note: Unlike ILR, a ‘Deep Freezer’ does not have holdover time, as it does not have an ice lining inside its wall. It is dependent only on the number of frozen ice packs kept inside it, if any. Can a domestic refrigerator be used instead of an ILR at the PHC? No, it is not recommended to use a domestic refrigerator for storing vaccines at PHC as the hold over time of this is only 4 hours.